STOP!!! This is the Wholesale Page for Irish Waxed Linen Thread. Minimum total Wholesale Order is $100.00*. Items may be mixed throughout the catalog. The $100.00 minimum does NOT include shipping and handling. Please stay on the wholesale pages when placing a wholesale order. Thanks! 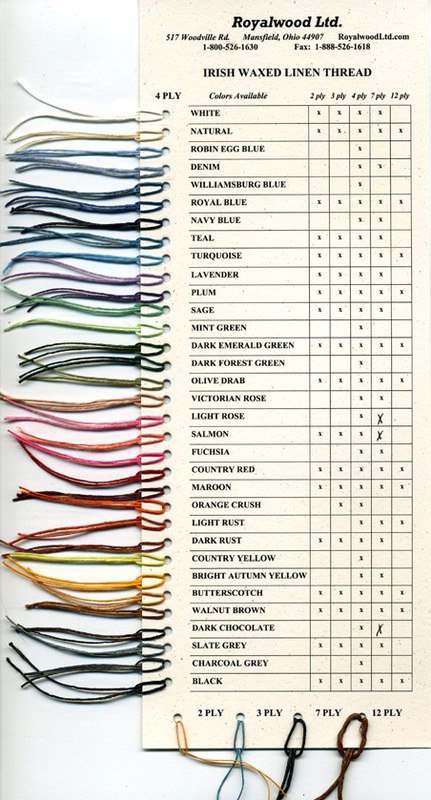 Color can vary significantly with dye lot. Order enough for your entire project at one time. There is NO shipping charge for this item alone. Shopping cart lists otherwise. Please ignore. The credit card will NOT be charged by the shopping cart service. This is something we do here at our shop. Your card will only be charged the $2.00 for the color chart. Please Note: Dyelots vary with each shipment. Monitors see colors differently. These colors are only for reference and WILL NOT BE EXACT!!! sizes & spool prices listed below color "chips"
50 gram spool - approx. 190 - 200 yd. * Minimum order is $100.00 at this price - for smaller orders see "Retail Catalog"
note: Merchandise can be mixed to achieve the $100.00 minimum. 50 gram spool - approx. 110 - 125 yd. Green, Magenta, & Lemon Yellow - Now Available in 3 Ply! 50 gram spool - approx. 90 - 100 yd. Green, Magenta, & Lemon Yellow - Now Available in 4 Ply! 125 gram spool - approx. 140 - 150 yd. Green, Magenta, & Lemon Yellow - Now Available in 7 Ply! 250 gram spool - approx. 170 - 180 yd. This cord is the "natural" linen color that we call: Heather Sand. For "Bulk" pricing on the Waxed Linen Thread - please call the shop. See All Our Wonderful Waxed Linen Patterns and Kits!